People ask me what I would pray when Anna was sick. I prayed all the time, for everything. But about six months before Anna passed away, I started praying the Rosary every night. The Rosary is a prayerful meditation on the life of Jesus and his mother, the Blessed Virgin Mary. I had discussed with Anna the love that Jesus’ mother had for her, and that the Blessed Virgin Mary was Anna’s mother in heaven. Anna understood in her heart and felt the strong love I had for her. When I told her that Mary, Jesus’ mother, loved her infinitely more than I could ever love her, she understood how incredible this love must be. Anna trusted that I was telling her the truth, and she believed. She believed that in heaven, there was so much love waiting for her there –that she would be well taken care of by the Blessed Virgin Mary, who loved her more than her own natural mother ever could. The Rosary gave me great comfort. I would pray it while she slept next to me in bed. I believed that while praying the rosary, the Blessed Virgin was close to me. I believed that because of the suffering Mary endured watching her son suffer, she understood my suffering and would beg God to come to my aid to try to do anything possible to help my daughter. If you would like to know how to pray the rosary, click on this you tube link, which provides excellent instructions, images of the mysteries in the life of Jesus and the words to all of the prayers. If you pray in “worldwide” mode, there will be others in the world who will be praying the rosary with you at the same time, as you follow along with the leaders voice. These Rosaries have been donated by a group of school children who make rosaries for mission work. They have been blessed by a Catholic priest. They are not part of Anna’s Gift, but a personal desire of Anna’s mom. Please send one envelope per rosary. Some of the rosaries are made personally by me, and also have been blessed by a Catholic priest. 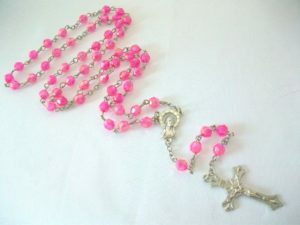 Hot pink rosaries are for the girls, black rosaries with one hot pink bead are for the boys. Please specify which you would like. 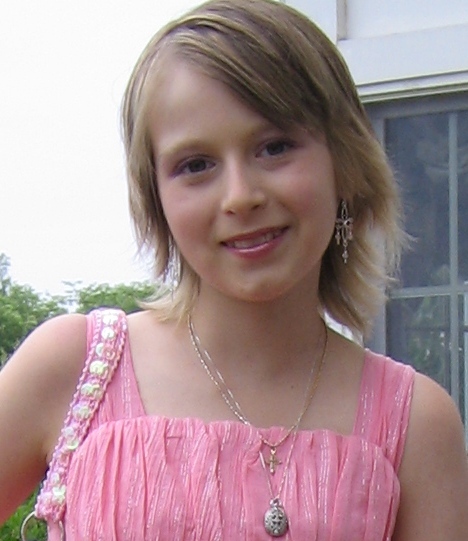 No money donated to Anna’s Gift has or will ever be used to make or send out rosaries.